Paddy Chayefsky came out of the US Army's 104th Infantry Division with a Purple Heart and a new first name on February 27, 1946, after almost three years of service in the European Theatre of World War II. He had just turned 23 by a month and was determined to be a playwright. The passion had been born in him in 1945 when Chayefsky, recovering in an Army Hospital at Cirencester, 80 miles outside London, after an encounter with a land mine at Aachen in Germany, wrote the book and lyrics to a musical comedy, No T.O. for Love. The work, produced by the Special Services Unit, opened at the Scala Theatre in the West End of London. This led to Chayefsky befriending Garson Kanin (1912-1999), already a very well established writer and director of plays and films, who invited Chayefsky to collaborate with him on a documentary of the Allied invasion, The True Glory. Chayefsky's release from military duty coincided with Kanin's play Born Yesterday opening on Broadway, beginning a run there which would extend to the end of 1948. Back in New York City later in 1946, Chayefsky happened to bump into Kanin and his wife, Ruth Gordon (1896-1985), a screenwriter and playwright as well as a renowned film and stage actress. The couple, impressed by Chayefsky's single-mindedness and enthusiasm, gave the budding playwright $500 to make his start and write his first full-length play, the never-to-be-produced Put Them All Together (aka M is for Mother). This photograph of Paddy Chayefsky at a typewriter in a garment factory was taken by Michael Rougier for a June 6, 1955, LIFE magazine spread titled "Bride in the Bronx: Chayefsky builds his new play on wedding plans", which began by describing Chayefsky as "the most celebrated of the young TV playwrights". In the event, the photo was cropped to a thumbnail, with the typewriter only just visible. How did Chayefsky go about learning to type plays? Well, in the words of Marc Norman in What Happens Next: A History of American Screenwriting, "To learn drama's rhythm, Paddy typed out [Lillian] Hellman's The Children's Hour word for word." This 1934 drama is set in an all-girls boarding school and is based on a false accusation that two headmistresses are having a lesbian affair. Norman goes on to write that Chayefsky, in order to "learn comedy", then proceeded to type out the full script of The Front Page. This, of course, was a hit Broadway comedy about tabloid newspaper reporters on the police beat, written by two former Chicago journalists, Ben Hecht and Charles MacArthur, and first produced in 1928. 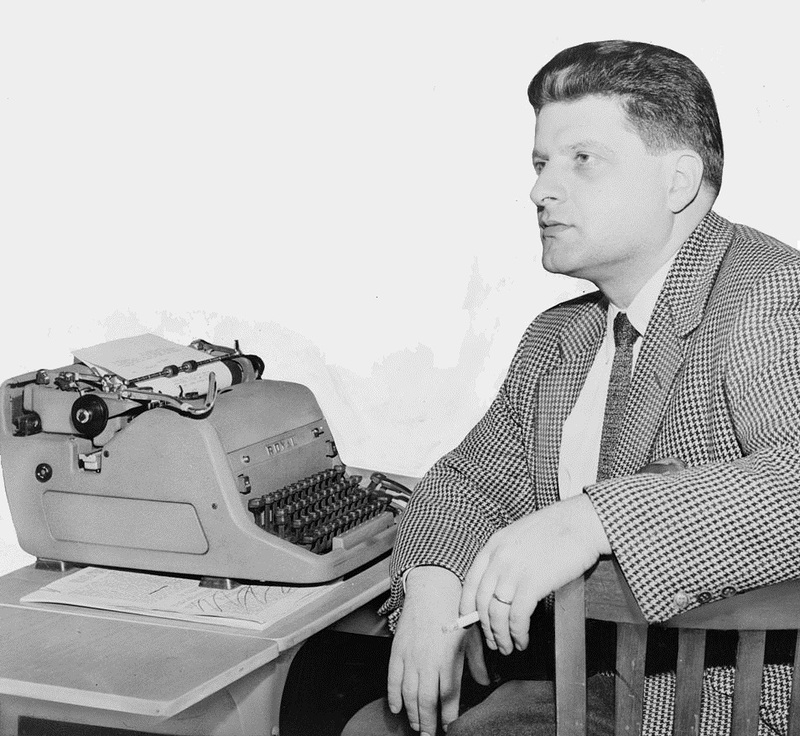 Chayefsky was born Sidney Aaron Chayefsky in The Bronx on January 29, 1923. He is the only person to have won three solo Academy Awards for Best Screenplay (the other three-time winners, Francis Ford Coppola, Charles Brackett, Woody Allen, and Billy Wilder, have all shared their awards with co-writers). Chayefsky's Oscars were for Marty (1955), The Hospital (1971) and Network (1976). Chayefsky died of cancer in New York City on August 1, 1981, aged 58. Chayefsky in 1976, the year he wrote Network. He had an interesting and good way of learning. Determination led to success. 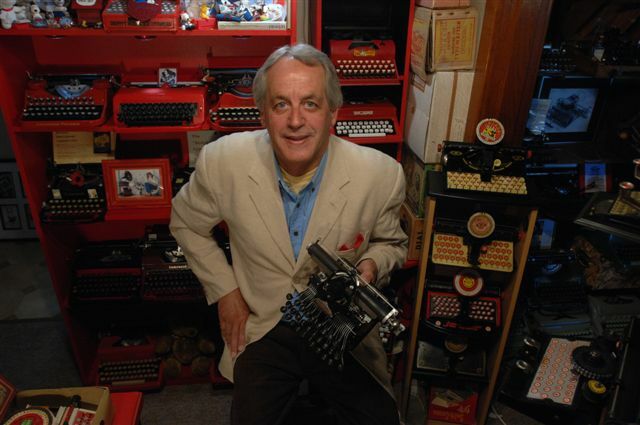 More good fodder for my "Writers and their Typewriters" page!